Will having an armed posse keep Maricopa County schools safer, or is a pretense to police immigrant and youth of color? Maricopa County Sheriff Joe Arpaio's plan to increase volunteer-posse patrols near schools in his jurisdiction has generated publicity as political leaders across the nation struggle to find solutions after last month's elementary-school massacre in Connecticut. The proposal to use volunteer patrols near campuses was simple enough that it could have been implemented without expending many additional resources. But the plan so far has come with more questions than answers. An e-mail that circulated among administrators and parents in one West Valley district on Monday provided the most detail the public has received to date on what the posse patrols would entail. It also served as the first formal acknowledgment that a plan to deploy armed volunteers on campuses was actually afoot. Arpaio first mentioned the idea in an interview with The Arizona Republic in late December when discussing state Attorney General Tom Horne's plan to provide weapons training for one designated employee at every public school in Arizona. Since then, the sheriff has appeared on national talk shows to tout the idea. But no one from the agency had spoken with Litchfield Elementary School District administrators, who would have to approve any plan for armed posse members to patrol school grounds. Litchfield is one district that would be affected by the plan. 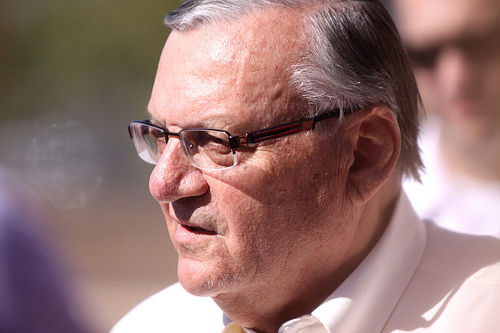 "We all saw on the news that Sheriff Joe was going to do this," said Ann Donahue, a district spokeswoman. "No one contacted us directly. All we wanted to be able to do was respectfully find out what their plan was. We're hoping to hear from the Sheriff's Department on their plan and how they're going to implement it." Details on the proposal are scant, including how many schools might receive the increased patrols. But Arpaio has said posse members will be dispatched to areas around school campuses in unincorporated areas of the county and in 10 cities where the Sheriff's Office has contracts to perform law-enforcement services. That presents a wrinkle for districts such as Litchfield Elementary, which has 13 schools in four cities. Some of those cities have their own police departments, and the posse would likely not patrol there. It leaves open the possibility that some schools within the same districts would not have the same volunteer presence. "I don't think it's a bad idea, it's just in a situation like ours, there are going to be a little bit of logistics involved," Donahue said. "We work very closely with law enforcement in those cities." Under Arpaio's proposal, the patrols would use more than 300 members of the volunteer posse, who are certified to carry weapons, in addition to more than 100 reserve deputies. The volunteers work under the direction of sworn deputies and can make traffic stops or detain people at the specific direction of those sworn deputies. Arpaio said he hopes a visible presence of marked patrol cars in areas around schools would serve as a deterrent to anyone intent on harming someone inside the facilities. The posse members, whether they patrol school parking lots with the consent of school administrators or nearby neighborhoods without that permission, would not be intended to serve as an on-campus security force, Arpaio said. If police action was needed, the school posse would rely on sworn deputies who regularly patrol near schools, he said. "They're out there anyway; they're just going to be giving people some more attention around the school grounds," he said. The school-posse members have not yet received any special instruction for the task, aside from the basic law-enforcement training offered to all posse members. But sheriff's administrators expect the school-posse members to receive additional training on use-of-force issues and coping with an active shooter. The matter of what the volunteers would be on the lookout for presents a thornier issue. Sheriff's deputies last month arrested a 16-year-old student from Mesa's Red Mountain High School after she reportedly made threats online about blowing up the school. The man responsible for the elementary-school massacre in Newtown, Conn., was 20. Neither would have looked out of place driving to a high-school campus, Arpaio concedes. But the sheriff is hoping the publicity about the patrols will keep any homicidal people off school grounds. "This will be mainly a deterrent, prevention, that's why we're sending marked cars out there," Arpaio said. "But if we need to take action, we will. It is a deterrent to let the bad guys know (that) if you're going to come on grounds, you're going to have some big problems."